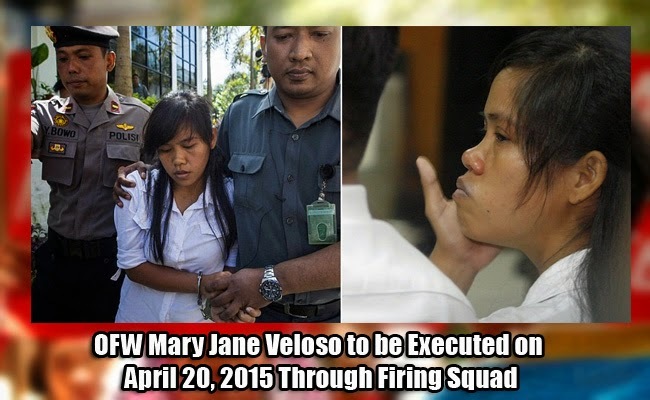 Mary Jane Veloso will be executed on April 28, 2015 through firing squad for the case of drug trafficking in Indonesia. The Filipina had been fully informed about her case and her execution according to National Union of People's Lawyers (NUPL)’s Atty. Minnie Lopez. Lopez shared that Veloso was able to talk with her sibling through the phone and she told them that the embassy officials and the justice department had already served her notice with the date of her execution being on Tuesday, April 28. The family expressed that they were devastated of the news. They will be going to Nusa Kambangan, Indonesia’s prison island to see Veloso on Sunday. Furthermore, as reported by ABSCBN news, Lopez said that the exact time of the execution was not yet divulged, but the Indonesian jail personnel says that the executions are usually held at midnight. Lopez described Veloso to be calm as she had seemed to have accepted her execution. It was in 2012 when the Indonesian authorities intercepted Veloso in Yogyakarta airport for possessing 2.6 kilograms of heroin. It is confirmed that Veloso recived the notice of her execution and she had signed on it. Her parents, two children and sister braved their way amids the journalist to get to her on April 25. Her mother said that if his daughter dies, he will hold many people as accountable for her life. On the other hand, Veloso’s sister Darlene said in a vigil held in Cabanatuan City that they will not lose hope until the very last minute. She believes that the decision of the Indonesian courts can still change as her sister does not deserve the punishment of execution because she is innocent. It was on April 24 when the country’s embassy filed a second judicial review in Indonesia. Department of Foreign Affairs admitted that they had not been informed about the decision of the Indonesian government. Maria Lumen Isleta, Philippine Amabassador to Indonesia, said that the Indonesian government had been informed that a second appeal had been sent to them. She hopes that they will still change the decision.